Go ahead smack my hand, I know. I have been a major slacker on the blogging front. I would like to thank everyone for all of the well wishes! I got so many very sweet messages, thank you so much. I am feeling so much better after 3 weeks of medication. One more week to go! The pain is all gone and my energy levels are almost back to normal. Between my being sick and our trying to move to Chicago, we really have been busy around here. We are starting to get a solid wall of boxes in the living room. Hopefully we will soon have a place to move them too. Yes, the apartment hunt is still on… We did delay it for a week or so when I first got ill , since we didn’t know for sure how soon I would be able to move. Now it is all back on, we just need an apartment and a move date. haha! I added a new feltidermy to the shop this week that is a little bit different. 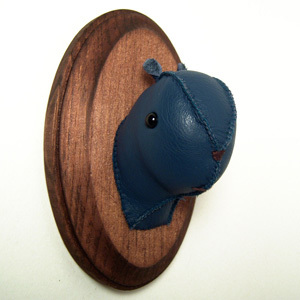 It is a squirrel, but this one was made from recycled leather. My mom worked at a furniture store years ago and used to bring home the discarded upholstery samples. The leather for this squirrel came from one of those samples. I did it mostly to see if I could actually hand stitch through leather. It was not as easy as wool felt, but hand stitching did work. Love the Leatha, and the color. Cool! That squirrel is too too awesome! Are you going to apply to Lollishops? You really should! I just joined up and I’d be so happy to see you there too! i glad to hear your feeling better. i love this new little guy out of repurposed leather. what a great departure from your already incredible work. i hope you make more like this. That little guy is great. I like that he is blue and then knowing you used old leather makes it even better! That is so funny and cute. Love it! I love your felitdermy! What an awesome, creative idea. You really made me laugh out loud! Glad you’re feeling better, Kate. I tagged you! Check my blog for info. glad you are feeling better! and love the feltidermy! I just love your feltidermies! Good luck with the move. I’m in the same world of too many boxes & too little floor space myself!